Proteins are central players in life processes and are among the most versatile and essential biomolecules. Structural proteins help build and repair tissue, including bones, cartilage, muscles, skin and blood. Enzyme proteins are essential to many chemical reactions. Antibodies — Y-shaped proteins produced by B cells — are responsible for immune defenses against disease. The new method bypasses the challenges of extracting, purifying and stabilizing membrane proteins, producing them instead within the host — in this case, a mouse. The study further demonstrates that such proteins are capable of efficiently stimulating the production of specific antibodies, which can bind with the membrane proteins and modify their function. The technique paves the way for a new generation of vaccines and drugs targeting aberrant membrane proteins linked with a broad range of diseases. "We have to isolate membrane proteins in order to study them. But during that isolation, we lose most if not all of the critical epitopes — what we call conformational epitopes — that are recognized by the kinds of antibodies that can be used for structure determination or that can affect the function of the membrane protein,” Hansen said. “These 'functional antibodies' are very rare but are extremely valuable as therapeutics because they can up-regulate or down-regulate the activity of that specific membrane protein. We're making the kinds of antibodies that you just can't buy off the shelf." Membrane proteins perform a variety of essential tasks. They are intermediaries between drugs and their target cells and act as critical interfaces between organisms and disease-causing pathogens. The particular form of protein attached to a membrane varies depending on cell type and subcellular location. A clearer understanding of membrane protein structure and function is essential for the design of new therapeutics to target them, though such proteins account for less than 1 percent of the 100,000 unique protein structures presently catalogued. To date, investigating membrane proteins and designing vaccines and drugs that can effectively interact with them has been a daunting challenge for medicine. This is largely due to the unique nature of such proteins, which are folded in elaborate three-dimensional forms and attached to or embedded in cell surface membranes. Extracting and stabilizing such proteins outside of their native environment is tricky and often doesn’t work very well. Some membrane proteins, especially those involved in cell-to-cell signaling, are attached only to the cell membrane surface, while others have one region buried within the membrane with domains protruding on one or both sides of it. These so-called integral proteins form channels and pores used to transport molecules into and out of cells. The new technique involves injecting a DNA sequence that codes for the membrane protein — a method known as genetic immunization. In this way, the cell’s own machinery builds the membrane protein within the organism, which is then recognized by the immune system. The plasmids penetrate dendritic cells, an important component of the immune system. Dendritic cells incorporate the injected plasmid DNA and translate it into the amino acid sequence of the desired membrane protein, just as if it were a naturally occurring gene. Finally, the dendritic cells express the membrane proteins and present them directly to the mouse’s immune system, which responds by producing specific antibodies, much as the immune system does naturally when confronted with a foreign biological threat. The researchers have made most of the plasmids in this study available to the wider scientific community, through the DNA plasmid repository, DNASU. 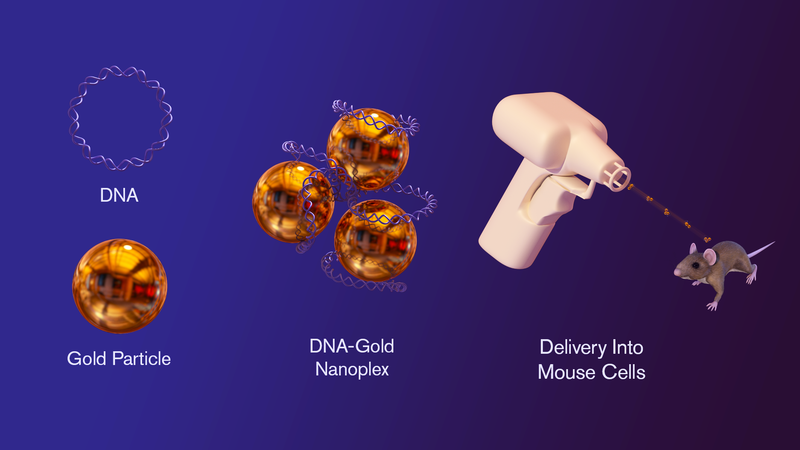 The method of DNA-immunization with a gene gun, also known as biolistic delivery, is superior to traditional techniques of immunization, in which pre-formed proteins or protein fragments dissociated from their membrane environment are delivered into the host in order to stimulate antibodies. Instead, proteins produced by DNA-immunization are significantly better at generating antibodies capable of binding with the complex membrane protein conformations and modulating their activity in an efficient and highly specific manner. The study confirms the group’s earlier findings suggesting that DNA immunization is an attractive method for producing therapeutic antibodies to membrane proteins using genes alone, as this method of immunization induces the host to express, properly fold and modify membrane proteins within their native environment. Further, the technique should be applicable for the production of non-membrane proteins as well. "The micronanoplex method that we describe allows for an order of magnitude greater delivery of DNA to the immune system, compared to existing methods. Only now is this high-load approach being applied to antibody production. It's an exciting time. The effective methods are still being developed for making therapeutic antibodies against cell-exposed protein targets."